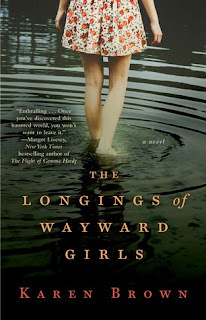 I liked The Longings of Wayward Girls a lot though it did take me awhile to get into it. There are a lot of characters and each chapter alternates between the past and present which made it quite difficult to follow at first.The story is quite a complex one so I found it very challenging to be able to stick with it and, in fact, it took me until about halfway through the book, or even a bit more, before I found a rhythm in the story that I could work with. All that being said, this story is worth reading. For anyone who likes a good mysterious, suspenseful story, this is definitely one you would enjoy. Part love story (but only in the most abstract of ways) and part reminiscence, The Longings of Wayward Girls has many twists and unexpected developments which is partly its strength but also partly what made it difficult to follow. The characters could be a bit more developed. I found it interesting how the younger characters, that is to say, the characters in the chapters dealing with the past, seemed to be older than their years or perhaps a bit wiser than they should have been. Perhaps though, the disappearance of another girl forced them to grow up too soon. I found myself questioning reactions and things the characters said, trying to figure out the reasons behind them which I quite liked. So this story was a challenge in many ways but it had many good points though I found it hard to follow at times. Ultimately though, it was an enjoyable read and I was happy I stuck with it. I'm busy reading this one. I hope I will like it!